Alpha Centauri is my nostalgic attempt to have my first WWIV board up and running. Currently there has been a resurrection of WWIVnet and it is operational and networked with more than 12 other WWIV boards at this time. If you are interested in technical conversation about WWIV software, this is the place. Also have some door games up and running for those who like to play as well. Just be aware this is on port 2002. Connect to Alpha Centauri BBS Now! 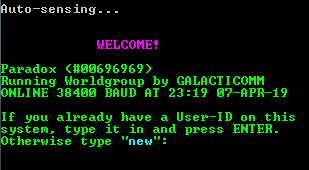 This BBS is using a non-standard telnet port (2002), the web telnet script may not work.